Great Barrier Reef Tours |Whitsunday Holidays. The amazing Great Barrier Reef is one of the 7 natural wonders of the World, and it really is a must see if you are visiting the Whitsundays. Luckily for you, Hamilton Island is the perfect base for exploring this spectacular part of the world! 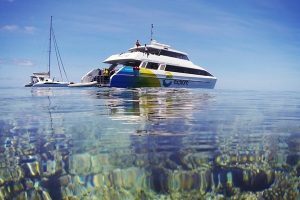 Cruise Whitsundays offer daily trips departing Hamilton Island Marina on board their purpose built Reef vessels, so they will get you there in comfort and style. With so many different ways to explore the Reef, you can be sure that Cruise Whitsundays will provide the perfect fit for you. You may like to stay dry and enjoy their amazing underwater viewing chamber or take a scenic flight over the Reef. Or you can dive right in and snorkel or scuba amongst the breathtaking coral formations and beautiful tropical fish. Don’t miss out on your chance to experience what might just be the best day of your life! Contact Whitsunday Holidays and we can assist you with reserving your place at the Great Barrier Reef today. 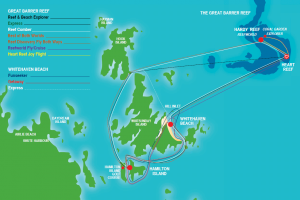 See the Cruise Whitsundays Great Barrier Reef Brochure here. Experience the Great Barrier Reef from every possible perspective with this combination Fly/Cruise package to Cruise Whitsundays Reefworld. 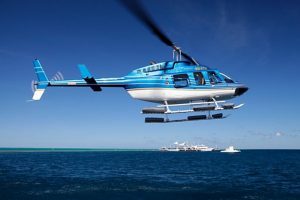 This tour features a 35 min scenic flight encompassing views of the Whitsunday islands, Hill Inlet, Heart Reef and outer reef. 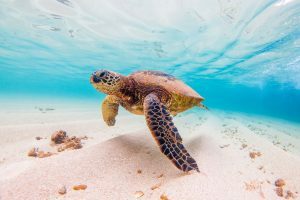 This half day cruise visits secluded locations within the northern section of the Whitsunday Islands which have the best fringing reef areas especially for snorkelling & diving. Explore beneath the waves and see for yourself the abundance of coral and marine life this outlandish landscape has to offer. 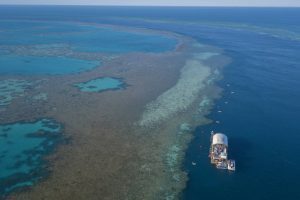 Experience a full-day Great Barrier Reef diving adventure taking you to selected moorings around Bait Reef – the closest of the outer reef locations. Accessed by our premium catamaran, guests dive directly off the vessel’s diving platform. Star gazing by night, exploring by day - it really doesn't get much better than this! With Cruise Whitsundays you have the amazing opportunity to spend a night sleeping under the stars at the Great Barrier Reef! This incredible full day experience lets you enjoy an outstanding range of interactive Great Barrier Reef Adventures.